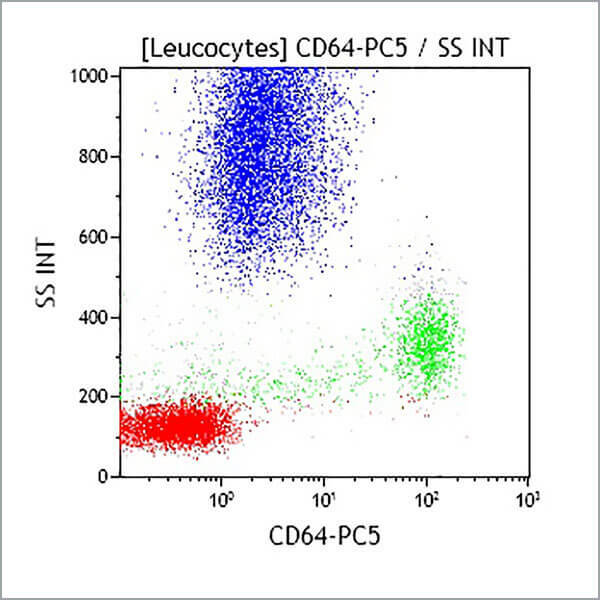 The CD64 antigen (FcγRI) is a glycoprotein with a molecular weight of 72 kDa. It belongs to the Ig superfamily, consisting of three C2-like Ig domains. It is the high affinity receptor for IgG and is able to bind monomeric human IgG1 and IgG3. This antigen is expressed on macrophages and monocytes. It is also expressed on neutrophils when induced with interferon γ (IFN-γ) and granulocyte colony-stimulating factor (G-CSF).